STANTON, ROBERT, businessman, public servant, and publisher; b. 6 June 1794 at Dorchester (Saint-Jean), Lower Canada, eldest son of William Stanton of the Royal Navy and Margaret Stanton; d. 24 Feb. 1866 in Toronto, Canada West. In 1805 Robert Stanton’s father moved to York (Toronto), Upper Canada, with his large family to become sergeant-at-arms to the House of Assembly. Robert attended John Strachan’s school at Cornwall in 1806, and enrolled in the Home District Grammar School, where Robert Baldwin* was a fellow pupil, when it opened at York in 1807. 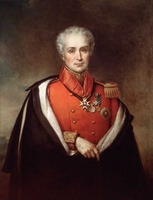 In 1810 he entered the office of the lieutenant governor, was transferred to the surveyor general’s office in 1811, and in 1812 was a copying clerk to the assembly. Commissioned lieutenant in the militia, he saw action at Queenston Heights and in April 1813 was captured at York. 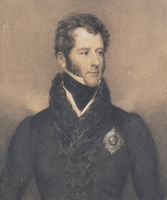 He was commissioned lieutenant colonel on 2 April 1827, and colonel on 16 July 1835, in the 1st West York Regiment. A Tory, he helped defend Toronto against the rebels in 1837 along with five of his brothers. Stanton had moved to Kingston as a clerk in the Commissariat Department after the War of 1812. There on 2 Sept. 1816 he married Frances D. Spafford and they had at least ten children. She died in 1844, and on 14 April 1845 he married Anna Louisa Newbigging, née Hagerman, niece of Christopher Hagerman*. In Kingston Stanton was secretary in 1817–18 of the Lancastrian School Society which operated the Midland District Grammar School. In 1818 he was selling hardware at H. C. Thomson*’s shop; he opened his own in 1820. He was elected assessor for Kingston in 1819 and commissioned magistrate for the Midland District in 1821 and notary public in 1823. His skill in accounting led to his appointment to a committee to investigate the affairs of the “pretended” Bank of Upper Canada in February 1823. That year, as a returning officer for the counties of Lennox and Addington, he closed a poll on Good Friday to the detriment of candidate Marshall Spring Bidwell*; the election was declared null and void by the House of Assembly. Stanton’s action was deemed illegal but not “corrupt and malicious.” Nevertheless, his first encounter with a Reformer was not auspicious. In 1826 Sir Peregrine Maitland* unexpectedly appointed Stanton king’s printer. He sold his Kingston business, moved to York, and set up shop with Robert Watson as his foreman. Apart from his official duties as king’s printer and as publisher of the Upper Canada Gazette, Stanton engaged in other ventures: he sold stationery and supplies, did job ruling (of paper) and book binding, and sold insurance for Phoenix of London. In 1834 he was a founder of the British America Assurance Company, and later was manager in Toronto of the Western Assurance Company. Stanton was the first printer to recognize the local trade union, the York Typographical Society, founded in 1832. Stanton also published, largely at his own expense, books, almanacs, and newspapers, some in conjunction with Watson. His most significant publication was the U.E. Loyalist, issued as a companion to the Upper Canada Gazette from 3 June 1826 to 24 May 1828 and then separately as the Loyalist for one year. Stanton, as journalist, was a spokesman for the Family Compact, intending the U.E. Loyalist to have “a just degree of influence in matters in which the Government may have felt an interest.” When the Loyalist degenerated into scathing editorials against anything related to Reform, Lieutenant Governor Sir John Colborne suggested that “the King’s Printer should be more exclusively devoted to the performance of duties strictly official.” Stanton complied with the suggestion, but not before he had earned the disapprobation of some of the Reformers. Stanton was commissioned magistrate of the Home District on 12 June 1827, and served on the Board of Health in 1832 when cholera first reached York. He was a member of the rebellion losses commission in 1838. 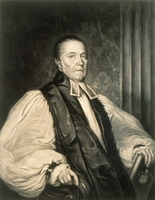 In 1841 he was defeated in the Toronto city elections by George Gurnett during an attempt to get moderates on the council. He held various offices in St James’ (Church of England), was a member of the St George’s Society, and accountant to the Toronto Turf Club. The union of the two Canadas left Stanton’s position as queen’s printer in doubt. As Lord Sydenham [Thomson*] assured him he would be considered, Stanton opened an office in Kingston, the new capital. 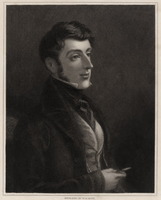 However, Sydenham died in September 1841, and that month Sir Richard Jackson*, the administrator, commissioned Stewart Derbishire and George-Paschal Desbarats as joint queen’s printers. Stanton was justifiably upset, especially when informed that the appointment had been arranged prior to Sydenham’s death. On Jackson’s advice, Stanton memorialized Lord Stanley, as well as all the governors of Upper Canada whom he had known. 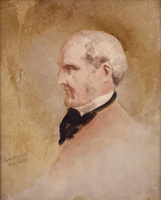 The new governor, Sir Charles Bagot*, offered him the position of sheriff of the Midland District, but Stanton refused because of the large bond required. Finally, at Stanley’s direction, Stanton was appointed a Home District commissioner of customs on 12 Aug. 1842 and collector of customs for the port of Toronto on 8 Aug. 1843. Six years later Hincks, again inspector general, investigated Stanton’s administration of the Toronto customs house. The ensuing report alleged falsification of customs records. 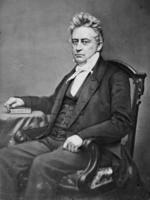 Stanton pleaded innocent, but he and two assistants were dismissed in November 1849 and W. F. Meudell, the investigator, was appointed collector. Stanton was immediately appointed clerk of process at Osgoode Hall, a position he held until his death in 1866. Stanton was a loyal servant to the crown and to the Tory principles of the Family Compact. A frequent casualty of the rise of Reform politics and government, at the same time he possessed sufficient tenacity to survive contrary winds of fortune without compromising his decidedly colonial world view. PAC, RG 16, A5, 3, 24 Nov. 1849. PAO, Macaulay (John) papers. UTL-TF, [Robert Stanton], “Narrative memoranda connected with my memorial to Lord Stanley,” [1841–43]. Examiner (Toronto), 2 Aug. 1843; 24 Oct., 14 Nov., 5 Dec. 1849. Kingston Chronicle, 22 Jan. 1819, 25 Feb. 1820. Kingston Gazette, 7 Sept. 1816, 11 Nov. 1817, 22 Dec. 1818. Toronto Patriot, 26 Feb., 14 March 1834; 13 Feb., 1 March, 5 June 1838; 1, 8 Aug. 1843. Toronto Star Weekly, 27 Oct. 1923. Town of York, 1793–1815 (Firth). Town of York, 1815–34 (Firth). Upper Canada Gazette (Toronto), 14 May, 27, 31 Aug., 3 Sept. 1835; 14 July 1836. Armstrong, Handbook of Upper Canadian chronology. Early Toronto newspapers (Firth). Robertson’s landmarks of Toronto, III, 354, 372. W. R. Riddell, “The Bidwell elections: a political episode in Upper Canada a century ago,” OH, XXI (1924), 236–44. Hilary Bates Neary, “STANTON, ROBERT,” in Dictionary of Canadian Biography, vol. 9, University of Toronto/Université Laval, 2003–, accessed April 20, 2019, http://www.biographi.ca/en/bio/stanton_robert_9E.html.